Foursquare is a company with all of four employees. Yes, they just hired their fourth, we’ve learned (hello, Nathan Folkman, formerly of Betaworks, where he worked on Bit.ly). And yes, that’s a fitting number. You might think that a company that recently closed some funding would ramp up hiring a little faster, but the truth is that they don’t have to. Why? Because their users are already doing quite a bit of work to expand and improve the service. 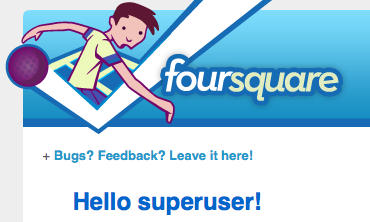 You see, some users of Foursquare that are very active earn the label “Superuser.” These are users with privileges that allow them to edit certain aspects of the site, which I’ll get into below. Full disclosure: I’m one of them, but only because I use the service so often. But I’m also only a “Superuser! – Level 1.” Today, the service started upgrading a very select group of users to the new “Superuser! – Level 2” distinction. In total, less than 1% (0.7% to be exact) of Foursquare’s user base received that distinction. The plan is to eventually have three levels of Superusers, but right now, there are only these two, Foursquare co-founder Dennis Crowley tells us. Level 1 users are able to edit venues (including names and cross streets), mark places as “closed,” and note duplicates. These new Level 2 users are able to merge venues themselves when there are duplicates. Eventually, Level 3 is likely to contain elements such as adding badges (rewards you get for certain check-in patterns), and policing other users, Crowley says. Those are some very impressive results, and suggest that Foursquare has a community that may be able to self-police itself like Wikipedia does. If that’s the case, the company can focus less on hiring people do to the tedious stuff, and more time building new features and expanding to new cities. It also will give them more time to work on potential business deals, which will eventually make the site money. Speaking of that, there’s a pretty nifty one in Las Vegas this week if you happen to be there for Blog World Expo. If you’re over 21, stop by the Planet Hollywood Hotel for a free shot at Koi Restaurant. You simply need to check in there to get it.